I wish I had better news, but the much anticipated cool front seems likely to disappoint most of us. Houston hasn’t had an overnight temperature below 68 degrees in two weeks, but more and more this week’s front looks more like something we’d expect in late August than in late September. That is, while we’ll see a change in wind direction and decreased humidity, temperatures are unlikely to fall much. Atmospheric moisture levels are fairly high across the area, which suggests a better possibility for rain today and Thursday than we experienced on Tuesday. However, conditions aren’t such that we should expect widespread showers or heavy accumulations. For the most part, we’ll just see partly sunny skies and continued warm days with highs of around 90 degrees. Winds shift from southeast to northeast on Thursday, but it will take time for the drier air to work its way into Houston. Some slight rain chances may linger near the coast on Friday morning, but for the most part we’re going to see mostly sunny skies as drier air works its way into the area from the north. With mostly sunny skies, daytime highs will remain in the upper 80s, but nighttime temperatures should be a few degrees cooler than we’ve been experiencing. The best part of this “front” will be the drier air that accompanies it, and makes for pleasant mornings and evenings. It won’t be cold by any stretch of the imagination, but when the sun isn’t beating down on your head, it will be pleasant. The onshore flow returns late in the weekend, which will allow humidity levels to begin rising again Sunday night and into Monday. This should put us back into a late-summer like pattern similar to that which the region has experienced for the second half of September—warm with moderate rain chances during the afternoon. 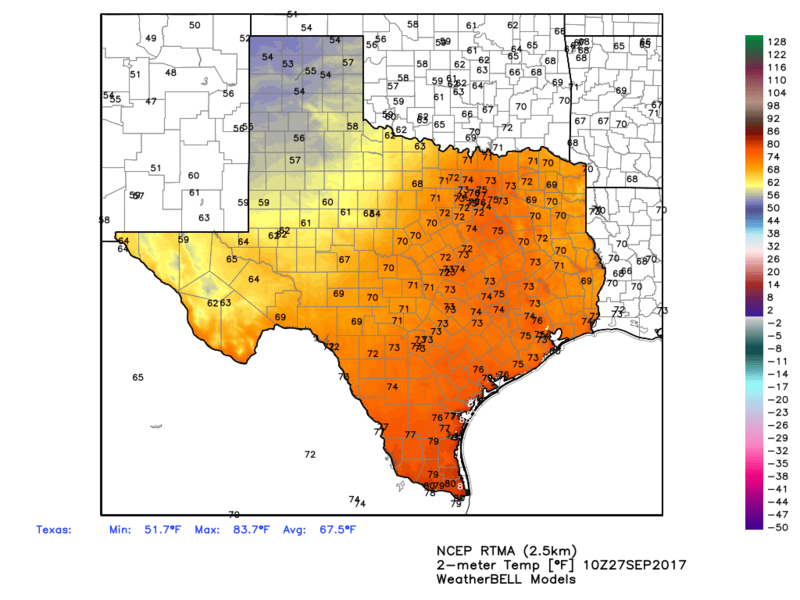 So when is a real, fall-like front going to move into Houston? There is no definitive answer on that, I’m afraid. There are some hints in the models about a pattern change in a couple of weeks, but for now I don’t see a robust front coming for the next week or 10 days. I can, however, assure you we’ll let you know as soon as we see one. Note: I’ll be speaking on Wednesday at a Houston Tomorrow event at noon regarding Hurricane Harvey and its effects on Houston. This discussion is free, and open to the public. Will there be 50″ of rain in three days? No? Then I’m good with a week cool front. I completely agree with Jason! Waiting for this heat to be over with, we want fall already!!! I tried to RSVP but couldn’t. 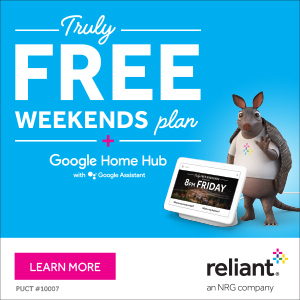 Any issues with walk-ins for tomorrow’s event? I’d like a little more notice if possible about speaking engagements like that at the Houston Tomorrow event. It would be something I would try to plan on attending. Thanks for making note of it.